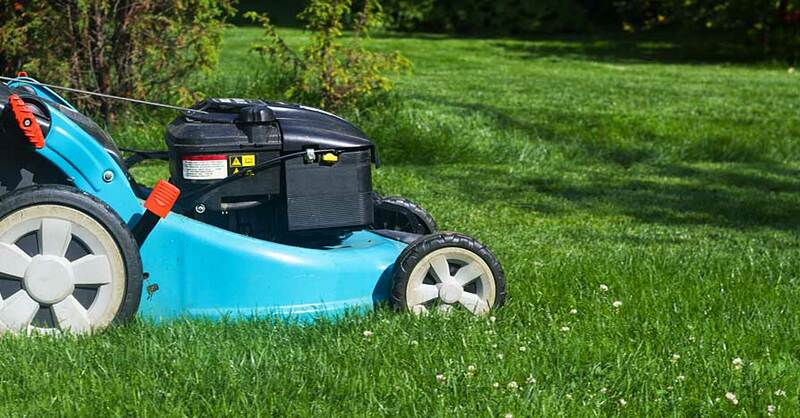 For most of us, mowing the lawn is a necessary chore that we must undertake every couple of weeks in order to keep the grass under control and the Homeowners Association hawks at bay. Unless you hire a service or a neighborhood kid to take on this task, it is up to you to get it done. 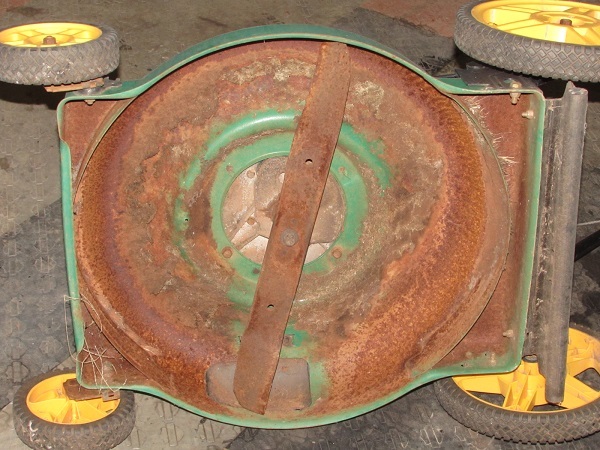 Why not spend an hour on a few lawn mower upgrade projects? One of the biggest issues with most lawn mowers is clogging up the deck with grass clippings. Even just a little moisture in the grass will leave chunks of grass sticking to the deck, reducing the efficiency of the lawn mower itself. Our first mower upgrade addresses the issue with a coating of graphite spray. 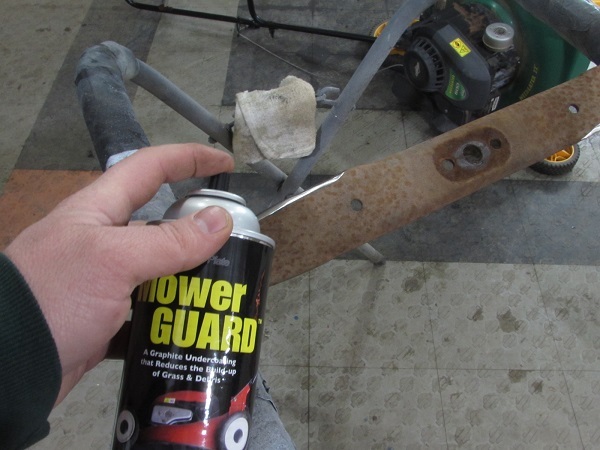 From the makers of SLIP Plate, Mower Guard is a dry-film lubricant that uses powdered graphite to provide a slippery surface for grass clippings. Graphite’s inherent hydrophobic nature, moisture simply does not stick, along with it, the grass clippings. They will simply fall away to be blown out the discharge chute. 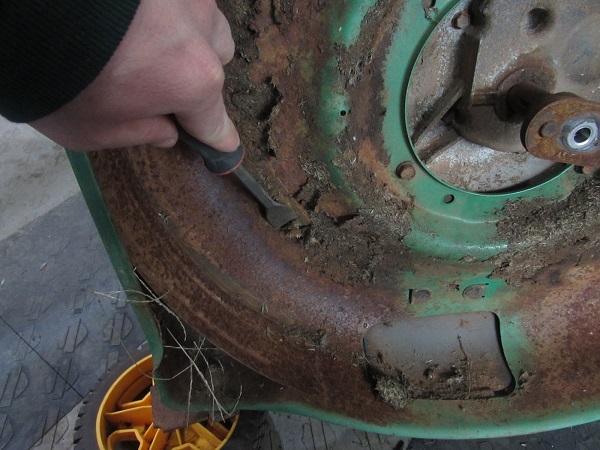 The crusty underbelly of your lawn mower gets clogged up with clippings, slowing down the blade and making it harder to push. Moisture is the glue that bonds to shredded grass to the metal. First, we unhooked the spark plug to prevent an accidental start-up. Then we removed the blade. It is not absolutely necessary, but we need to address the blade too. 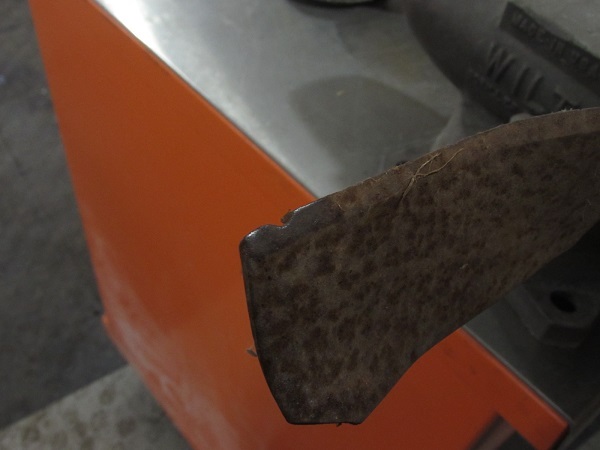 Using a scraper, the old clippings were removed. All of the clippings have to be removed before spraying the graphite. 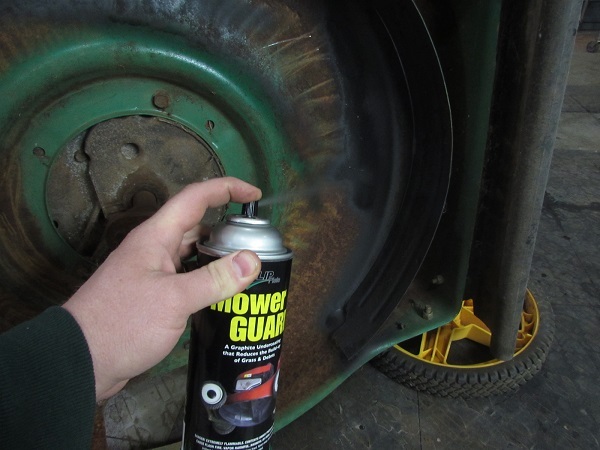 The Mower Guard sprays on easily. Don’t worry about runs, it will not effect the function. With the entire underside covered, the clippings will not stick, making the mower more efficient. A lawn mower is only as good as it’s blade. 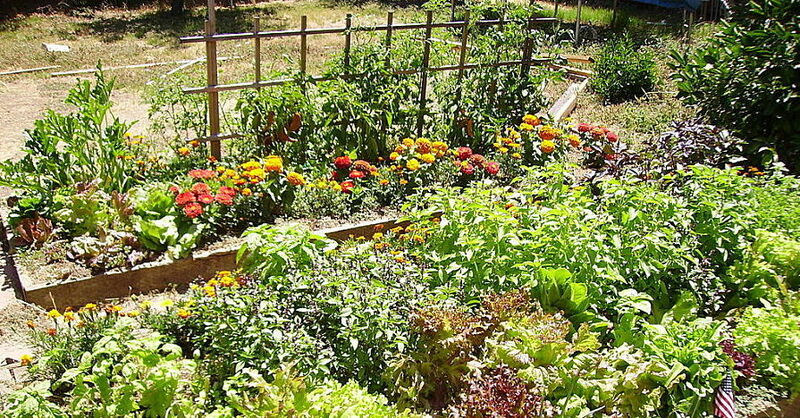 If the blade is nicked and dull, the grass is not cut, rather it is smashed and ripped. This slows down the engine, generates more heat and wears out the rest of the lawn mower faster. Not to mention that it requires more effort on your part to get the job done. Sharpening the blade is a quick mower upgrade that takes just a few minutes, yet it can save you hours in the hot sun. A dull blade with nicked edges rip grass apart rather than cut it. 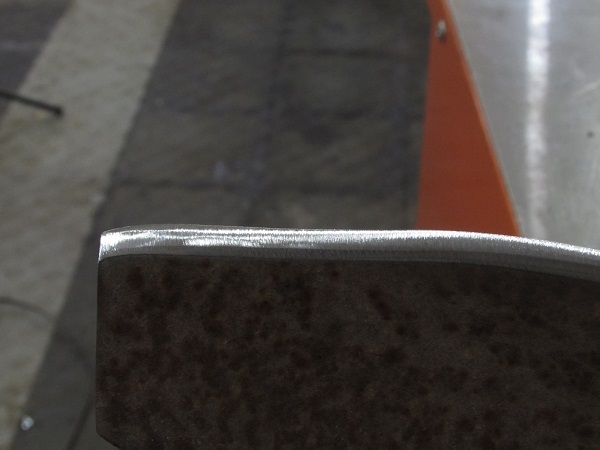 We used a flap wheel to clean up the nicks and sharpen the blade. The blade was also painted with the Mower Guard graphite spray as well. 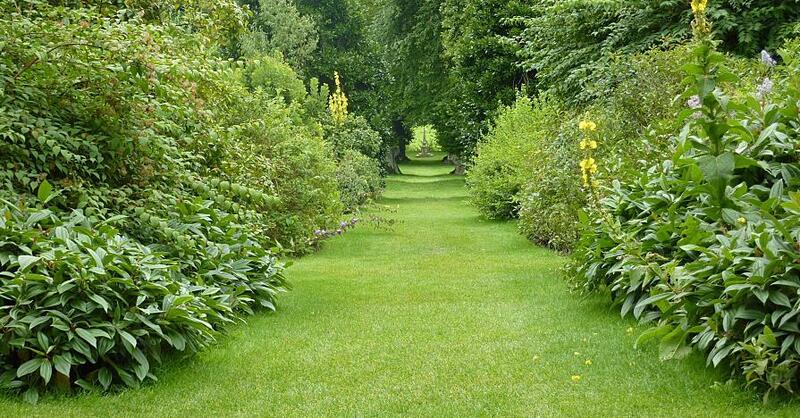 Unless you are using a power-driven mower, it is your power that moves the mower through the grass. 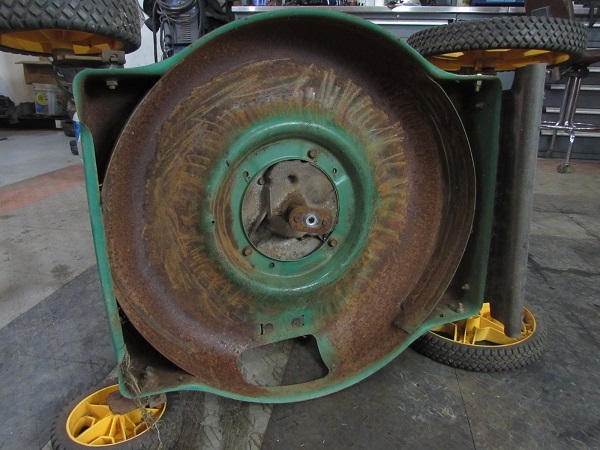 Most lawn mowers do not have bearings on the wheels, they use simple plastic wheels riding on hardened steel shafts. 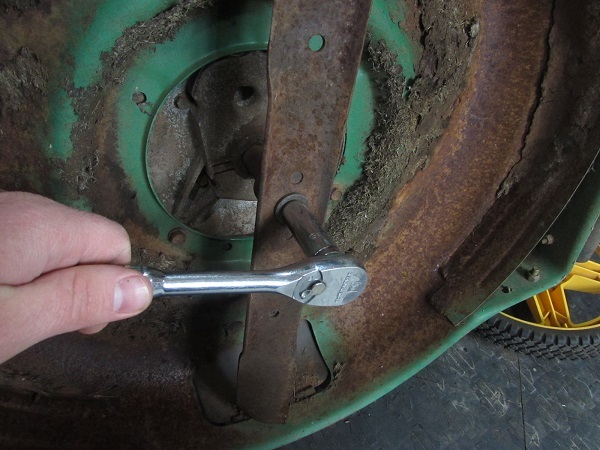 The lack of a bearing surface means that all of the weight of the mower is riding on one strip of the axle. This means a lot of friction and heat. 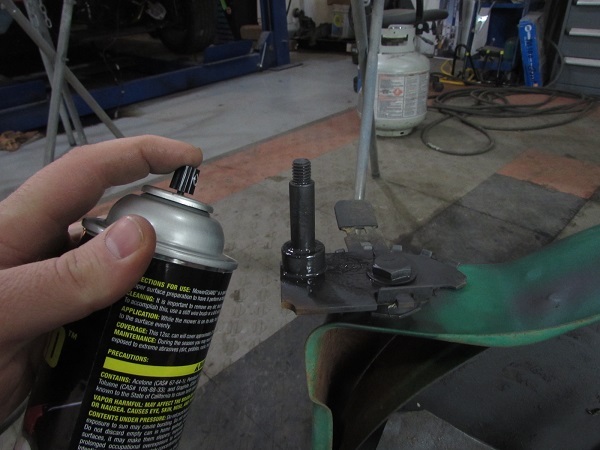 You could use a wet-film lubricant such as WD40 on the axles, but that only works for a short time and the oil draws in dirt and grass particles, which creates even more friction. 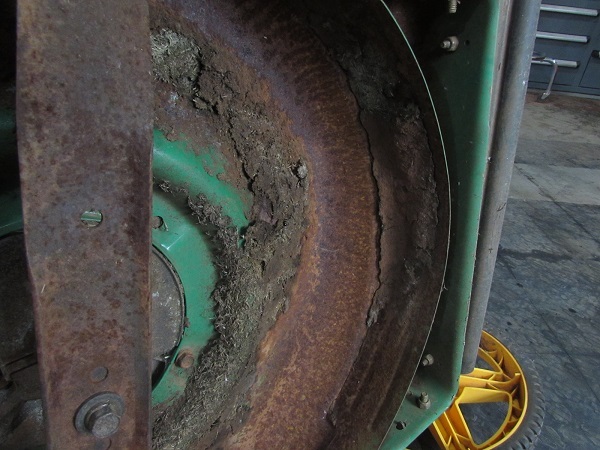 The better solution is to remove the wheels and treat them with Mower Guard Graphite Lubricant. Graphite resists water, so the axles will not rust, but the biggest benefit in this use is the lubrication factor. Graphite is one of the best lubricants available, and it does not dry out like oil nor does it attract dirt and other particles, so it stays clean. If you can shed a few pound of rolling effort, your lawn maintenance routine is faster and you can get back to enjoying your weekend. If the wheels are sticking, then you have to work harder to push the mower. 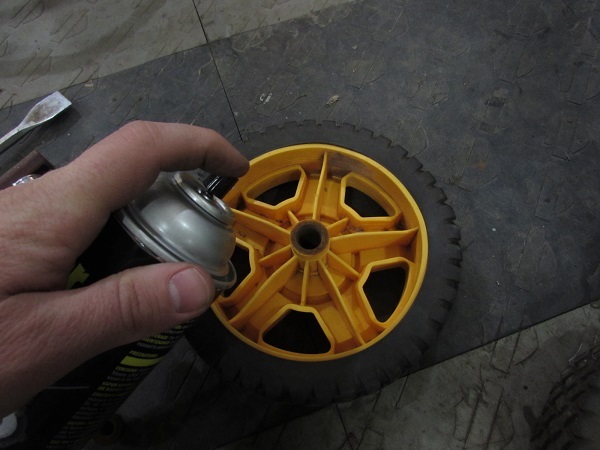 Graphite reduces friction, spraying the spindles reduces the effort to push the mower. 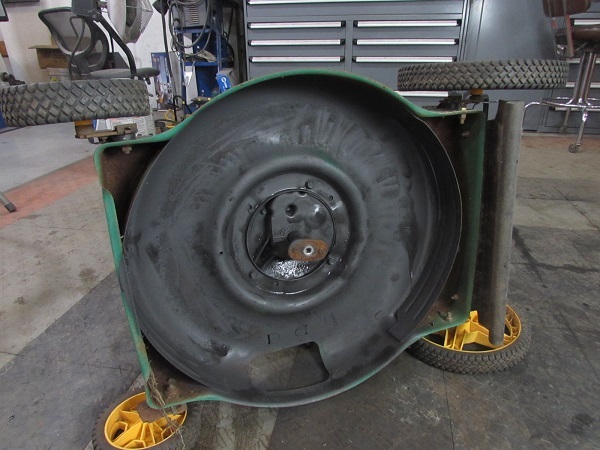 We also treated each wheel hub as well. 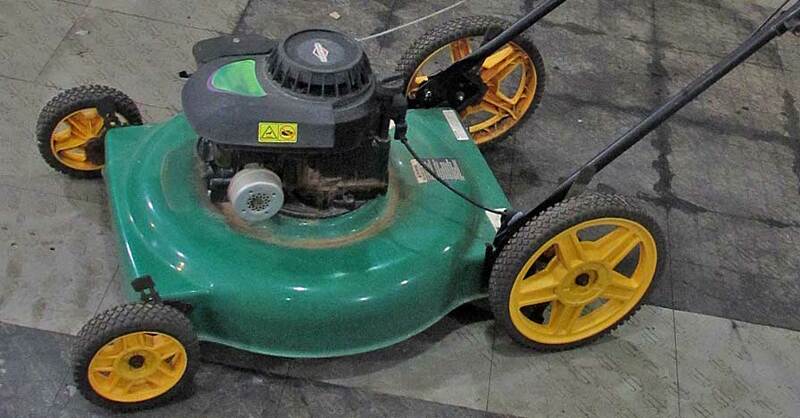 Now this mower is supercharged. 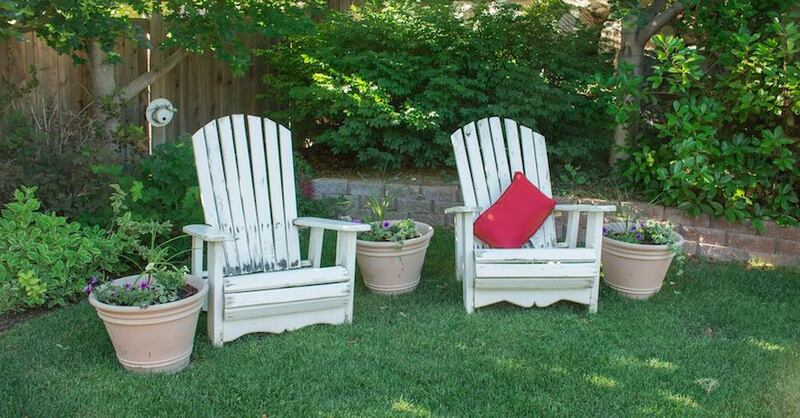 These tips will not only save your back, but also save your hard-earned money in less fuel and less wear and tear on your lawn mower. 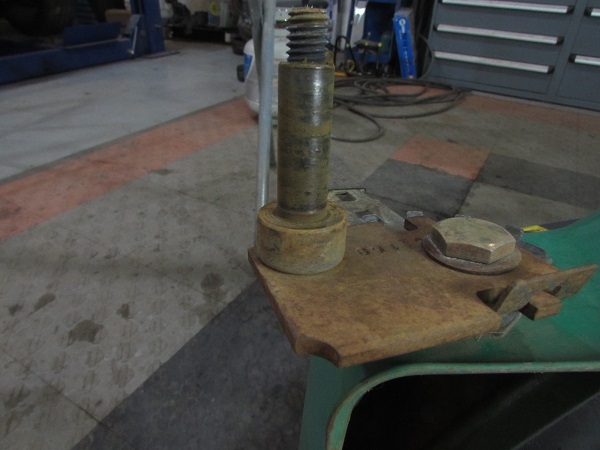 All three processes can be done in about an hour in your garage with just a few basic tools. Now that is NAPA Know How. Check out all the lawn & garden products available on NAPA Online or trust one of our 16,000 NAPA AutoCare locations for routine maintenance and repairs. For more lawn mower upgrade tips, chat with a knowledgeable expert at your local NAPA AUTO PARTS store.